The Cleansing Milk from Mellisa B Naturally is great. It is something you want to bathe your skin in, because of the natural ingredients that cleanse, nourish, soothe and rejuvenate the skin. The Cleansing Milk freshens up the skin. It does so much more than just cleanse the skin. Lucuma Fruit helps with cell regeneration, while Avocado Oil soothes, and promotes collagen production. The amino acids in Manuka Honey help keep pores clear while helping to protect skin's natural collagen. The fatty acids in Argan Oil keep skin nourished and hydrated. This cleanser does so much more than just get rid of makeup, dirt and oils left on the skin. Directions: Wet face with warm water. With clean hands, apply and massage cleansing milk into face. Rinse with warm water. Pat face dry. You can either go for the Microdermabrasion Scrub or the Pumpkin & Coconut Exfoliating Mask. If you cannot use either of those, just go directly for the Tri-Potency Peptide Serum next. The Mellissa Be Shimmering Face & Body Primer helps to soften imperfections, while locking in moisture, giving skin an airbrushed look. Dimethicone protects against moisture loss, while Mica gives skin a sheer shimmer, and Iron Oxides infuse a gentle warm-toned radiance. Directions: The Shimmering Face & Body Primer is designed to be used on face and anywhere on the body (arms, legs, chest, etc.) you want an airbrushed look. With clean fingers or makeup sponge, apply over your daily moisturizer. 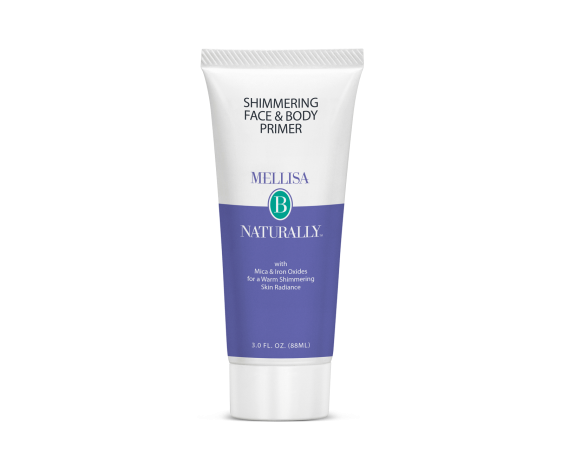 Makeup may be applied over Shimmering Primer; although with the soft, shimmering, airbrushed look our Primer achieves, you may want to skip the makeup. It can also be used as a primer, under makeup or mixed in with foundation to help give skin a nice airbrushed and ethereal glow. Both of these products are great. They do the job they are supposed to do and go beyond, doing it better. Mellisa B Naturally products are found online at www.mellisabnaturally.com. Like Mellisa B Naturally on Facebook: https://www.facebook.com/Mellisa-B-Naturally-928926020537634/; Follow Mellisa B Naturally on Twitter: @mellisabnatural; Follow Mellisa B on Instagram: https://www.instagram.com/mellisabnaturally/; Follow Mellisa B on Pinterest: https://www.pinterest.com/MellisaBNatural/ and Follow Mellisa B Naturally on Google+: https://plus.google.com/+Mellisabnaturally/posts.